The Russian side of the story, presented in the Syrian press, is that an al-Qaeda-linked group in Idlib, a northwestern province of Syria, used a shoulder-mounted missile launcher to shoot down a Russian fighter jet. 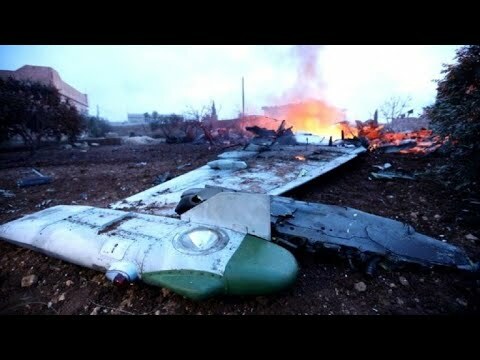 The pilot ejected and landed, but then was attacked by ground forces of the Syrian Conquest Front (Nusra Front). He put up a fight, refusing to surrender, and was killed. Turkey and those rebel groups in contact with Russia are working to retrieve the pilot’s body. Russia claims to have killed 30 SCF fighters in an intense bombardment campaign in Idlib, in response to the shootdown. 1. Where did the al-Qaeda-linked guerrillas get a shoulder-mounted missile launcher sophisticated enough to shoot down a fighter jet? (The US Pentagon is denying being the source). 2. Will this incident impel Russia to support a major Idlib campaign to defeat Nusra/ the Syrian Conquest Front entirely? The de-escalation zone announced for Idlib has broken down, with a major Syrian-Russian push in southeast Idlib that has caused the displacement of some 150,000 civilians. The SCF was never part of that agreement because the Russians consider it a terrorist organization with links to terrorists in the Muslim parts of the Russian Caucasus. But the SCF took over most of Idlib, attacking other fundamentalist guerrilla groups in the process. That combination of facts has rendered the idea of a truce in the province a dead letter. The writing on the wall is that the Russians, the regime and the Shiite militias will eventually try to take Idlib, one of the few remaining pockets of resistance to Damascus. 3. Does the Syrian Conquest Front/ Nusra Front have more such missiles? If the Russian Aerospace Forces start suffering more casualties and some pilots are taken hostage, will it affect Russian public opinion regarding the long and very expensive Russian war in Syria?